Q Scores are used to measure an athlete’s popularity level at any given moment. 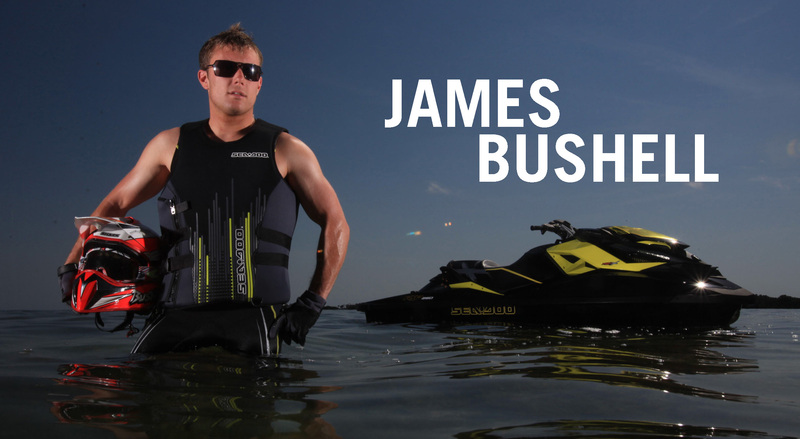 It is safe to say that in the world of personal watercraft no one’s Q Rating is as high right now as James Bushell’s. Bushell has had a tremendous year. The plan to turn the fit and model good-looking Brit into the new face of Sea-Doo watercraft performance category began last year when he won the hotly contested Pro Stock World Championship and finished third in the premier Pro Open class. Seeing his talent and potential on the up rise, BRP brought Bushell over to the states to be the “talent” on the new Sea-Doo RXP-X and the imagery he created can be seen in all of the 2011 marketing images and videos promoting this new model. This was also his opportunity to get some early practice on the new RXP-X T3 hull. That planted the seed in what the Sea-Doo racing minds saw as a potentially stellar year for the talented racer. Bushell left that photo shoot in early spring to go on to win the UK and European Pro Stock and Pro GP Championships before heading back to the United States to compete for a World Championship aboard a secret weapon. Bushell was teamed with Les Cooke of Australia – unarguably the most renowned Sea-Doo watercraft-racing tuner on the planet – on a special T3 hull equipped watercraft. With Bushell’s early seat time on the new hull and Cooke’s incredible power and handling set-up, confidence was high going into the IJSBA World Finals. True to Bushell’s low-key, down-to-earth demeanor, he seemed more at ease discussing how he was going to fill the demand for Sea-Doo boats at his UK based Sea-Doo dealership, 158 Performance, than talking about racing the days leading up to the Pro Finals. . .
What did come of the Pro weekend was the icing on the cake, the best-case scenarios, Bushell beating the best PWC racers in the world at their best, but it simply wasn’t enough. Capping off his professional year with the addition of two of the most prestigious PWC racing championships in the world and a PWC industry Q Score soaring to the moon! Lets get to know James Bushell a bit better through his own words. . . OnBoard – James, where did you grow up and how was your competitive spirit developed? Bushell – I grew up in Chambridge of the United Kingdom. Bushell – When off the water I try to go to the Gym three-four times a week and I play Squash, mountain Bike a lot and ride Motocross. When not doing sports I am busy at the shop, 158 Performance, we are a BRP Sea-Doo dealer. OnBoard – James, How were you introduced to watersports? 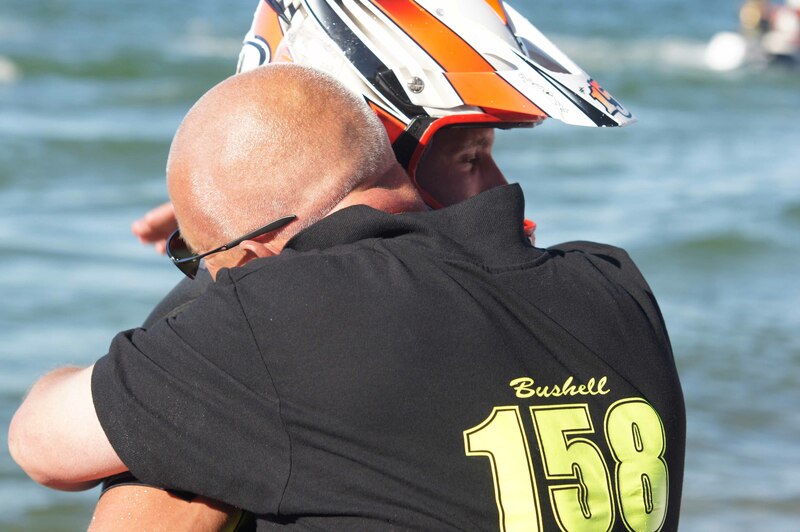 Bushell – I was first introduced to water sports when my dad bought a Jet Ski X2 when I was four years old. When I was around six he bought me one because I would not let him have a go on it and it all evolved from there. Bushell – I have won 20 British Titles and have been Britan’s #1 rider since 2006. I have also won six European titles and six World Titles including the two big ones this year. OnBoard – James, Where is your favorite PWC race site? Bushell – My favorite place to race is Lake Havasu (Arizona, USA) because I love the weather, the atmosphere and it is the PWC capital of the world! Bushell – I just love racing. I love going down the start grabbing the holeshot at 80 mph; can’t beat that feeling! I also love developing new skis and getting ready for the races both mechanically and physically. OnBoard – James, where is your favorite non-racing, riding location? Bushell – My Favorite non-racing riding location is Dubai, I love riding there, and the waters are so good. OnBoard – How was your experience being part of the 2012 Sea-Doo Photo shoot and being the face of the RXP-X? Bushell – Taking part in the Sea-Doo Photo Shoot was great, we had the best time. I was able to get a sneak peek at the new RXP-X and ride it a bit around buoys and in the chop. That helped me get an idea of how different the ride was and how much faster I could go on it. We were also able to meet some great people and it was a good experience that I hope I can have the opportunity to do again. Bushell – I will be racing the 2012 Sea-Doo RXP-X modified Turbo backed by Australia’s Sea-Doo Centre and tuned by Les Cooke and is AWESOME! I can’t wait for the 2012 season, as the new RXP-X will clean up as it did at the World Finals. Cheers! Lake Havasu City, AZ, October 21, 2011 – BRP Sea-Doo watercraft racer, James Bushell claimed two of the most prestigious World Championship titles in all of personal watercraft (PWC) racing winning both the Pro Open and Pro GP classes at the recent IJSBA World Finals. Bushell’s Sea-Doo Centre backed RXP-X* featuring the all new T3 hull design outclassed fields filled with the biggest names in the sport to collect his double championship. The combination of the Sea-Doo T3 hull, Australia tuner/builder Les Cooke’s abilities to bring the new Sea-Doo RXP-X innovations to the racetrack and Bushell’s skill left no question to onlookers which watercraft was the most dominant on the water and what was in store for the future from Sea-Doo RXP-X watercraft racers. 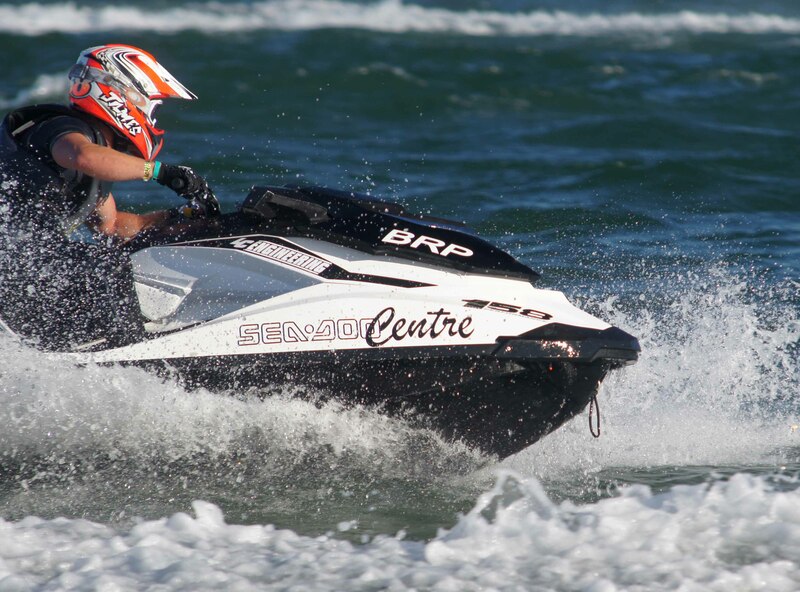 Bushell, co-owner of the BRP dealership 158 Performance in Stamford of the UK, claimed both Pro Open and Pro GP World titles aboard his Sea-Doo watercraft featuring the new T3 hull design that stands for tight,-turning, T-hull and offers true lean-in handling and tracks straighter in choppy conditions. Riders benefit from this design as they can utilize the power more efficiently in all areas of high performance riding minimizing fatigue, cornering faster and seemingly shortening the racetrack compared to the competition. “This was the first race for the new Sea-Doo RXP-X T3 hull design and it claimed the world’s most prestigious championship. This clearly shows that Sea-Doo continues to offer trend-setting products that set us apart from our competitors”, said Chris Dawson, vice-president and general manager of the International division. “The T3 Hull design is an example on how BRP always strive to push the limit and confirm that innovation is part of our DNA. In addition to Bushell’s spectacular double Pro wins, a total of 12 World Titles were captured by Sea-Doo watercraft racers at this years IJSBA World Finals event. The new 2012 Sea-Doo RXP-X watercraft will be available starting in January of 2012 and should you want a more detailed look at the new T3 hull, Ergolock system and stunning flowing facet design, visit the showroom at www.sea-doo.com for more information. You asked, we answered. Here is the Sea-Doo FAN Q&A for October. Please continue to send us your sea-Doo related questions. PARTICIPATION CONSTITUTES ENTRANT’S FULL AND UNCONDITIONAL AGREEMENT TO AND ACCEPTANCE OF THESE OFFICIAL RULES. #GOXTEAMGO Sweepstakes (hereinafter referred to as the “Sweepstakes”) is for a limited time and begins on October 5, 2014, at 12:00 am ET and ends on October 12, 2014, at 11:59 pm PT. The Sweepstakes is sponsored by Bombardier Recreational Products Inc. (“BRP” or the “Sponsor”) 565, de la Montagne, Valcourt, Quebec, J0E 2L0. NO PURCHASE OR CONTRIBUTION NECESSARY TO ENTER OR WIN. A PURCHASE WILL NOT INCREASE YOUR CHANCES OF WINNING. ELIGIBILITY: This Sweepstakes is open to legal residents of Canada and the United States (excluding Puerto Rico and Quebec) who have reached the age of majority in their states/provinces of residence as of the date the Sweepstakes begins. Employees of BRP, their subsidiaries, affiliates and advertising and promotional agencies of BRP, and their immediate families (spouse, parents, children, siblings and their spouses) and individuals living in the same household as such employees are ineligible. This Sweepstakes is governed by the laws of Canada and subject to all applicable federal and provincial laws and regulations. VOID WHERE PROHIBITED OR RESTRICTED BY LAW. PRIZES (2): One (1) Sea-Doo® X-TEAM Riding Gear Kit (To include: Sea-Doo Duffle Bag, Full Finger Vehicle Gloves, Sea-Doo Riding Booties, Performance X-TEAM Wetsuit, Force Pullover PFD, and X-TEAM Neoprene Riding Jacket Retail value: $ 592 USD / $650 CAD). During the International Jet Sports Boating Association (IJSBA) World Finals, an eligible individual (“Entrant”) may enter the Sweepstakes by following @BRPSeaDoo on Instagram, Twitter, Pinterest, or Vine. Entrant must post a “selfie” image of him/herself with a Sea-Doo watercraft in a performance setting, upload his/her picture to Instagram, Twitter, Pinterest, or Vine @BRPSeaDoo and tag the picture with #GOXTEAMGO. Each original “selfie” photograph submitted of the entrant with the performance Sea-Doo watercraft setting qualifies as an entry into the contest. Entries must be tagged with #GOXTEAMGO and @BRPSeaDoo. The third party application provider, Instagram, Twitter, Pinterest, or Vine @BRPSeaDoo, will monitor all entries and will tally all applicable entries. The Sweepstakes require that an Entrant either already have or open an account on Instagram, Twitter, Pinterest, or Vine @. Photos designated with the #GOXTEAMGO hashtag, instagram.com/BRPSeadoo www.twitter.com/BRPseadoo, www.Pinterest.com/BRPSeaDoo become the property of Sponsor, but Sponsor is not responsible for the content that is posted by contest participants. SELECTION OF WINNERS AND PRIZE CLAIM: Draw will be held on Thursday, October 16 2014 at Sponsor office located at Bombardier Recreational Products Inc., 565, de la Montagne, Valcourt, Quebec, J0E 2L0. Two individual winners are randomly selected. Odds of winning depend on number of entries received. Decisions of the Sponsor in the selection and determination of winners and all matters relating to this Sweepstakes are final and binding. The Sponsor will attempt to contact potential winners between 9:00 AM ET and 5:00 PM ET, Monday to Friday, for a period of five (5) business days following the date of the prize draw. If the Sponsor is not able to make contact with a potential winner within the allotted time, using his/her account on the social platform for which the potential winner submitted the winning entry, then at the sole and absolute discretion of the Sponsor, that Entrant may be disqualified, and his/her entitlement to receive the prize may be forfeited, and the Sponsor reserves the right to randomly select another potential winner, whom the Sponsor will attempt to contact, and who will be subject to disqualification, in the same manner. Once the potential winners have been identified, they will be sent an affidavit of eligibility and liability/publicity release. To become an official winner, all relevant documents must be signed and returned to Sponsor within three (3) business days from the time the affidavit and liability/publicity release is postmarked as having been sent by Sponsor, or the prize will be forfeited and another potential winner will be drawn. All prize claims are subject to verification. Should a potential winner be a Canadian resident, he/she must first correctly answer, without assistance of any kind, a time-based mathematical skill-testing question (i.e. : 2 X 10 ÷ 4 + 30 – 2) before being declared a winner and being awarded the prize. Sponsor BRP will do its best to accommodate the official winner in terms of coloration of the prize. Based on that, the prize will be shipped in the best delay possible considering availabilities. Sponsor shall not be held responsible for any delays in awarding the prize for any reason outside of their control. PRIZE AWARD: The winners must take delivery of their prize at a participating authorized BRP dealer confirmed by Sponsor no later than April 30, 2015, or prize will be forfeited. These rules are published on the Sea-Doo Onboard blog at https://blog.sea-doo.com/2011/10/01/goxteamgo-sweepstakes-official-rules/ At the end of the sweepstakes, the winners’ name will be published on the Sea-Doo Onboard Blog at https://seadooonboard.wordpress.com. By accepting the prize, participants consent to the use of his/her name, photograph, image, voice, and statements related to the Sweepstakes, for advertising purposes, without further compensation. There are no transfers, substitution and prize is non-refundable. No cash alternatives for any prize, except at the option of the Sponsor, who may substitute a prize of equal or greater value if advertised prize becomes unavailable. Sponsor reserves the right to terminate this Sweepstakes in whole or in part at any time without liability. Sponsor is not responsible if, for any reason, the game is not capable of running as planned, or for any infection by computer virus, bugs, tampering, unauthorized intervention, fraud, technical failures, or any other causes beyond the control of Sponsor which corrupt or affect the administration, security fairness, integrity or proper conduct of this promotion or of any person’s computer hardware or software. Should the game be terminated prior to the stated expiration date, notice will be posted on http://www.facebook.com/seadoo. Sweepstakes materials are automatically void if they are reproduced, mutilated, forged, altered or tampered with in any way, if they are obtained through unauthorized, illegitimate channels, or if they contain printing, production, typographical, mechanical or other errors. Only the number of prizes stated in the Official Rules will be awarded. This Sweepstakes is subject to all applicable federal, state, provincial and municipal laws and regulations and is void where prohibited by law. Entries generated by script, macro or other automated or mechanical means or means which subvert the entry process will be void. All entries become the property of Sponsor and will not be acknowledged or returned. Sponsor is not responsible for lost, late, damaged, misdirected, defaced, mutilated, illegible, incomplete, postage-due, or altered mail or prize claims or other entries or matters pertinent to this Sweepstakes. Winners are randomly selected. The Sponsor is not responsible for printing, distribution or production errors or errors by mechanical readers or for lost, late, misdirected or postage-due mail or entries. In the event that production, seeding, printing or other errors cause more than the stated number of prizes of any category to be claimed, Sponsor reserves the right to suspend delivery of prizes, without prior notice. By entering this Sweepstakes, each winner acknowledges and agrees that Bombardier Recreational Products Inc., BRP US Inc., their affiliates and their respective officers, directors, employees, dealers, agents and insurers (collectively, “the Released Parties”) (i) shall have no liability of any kind whatsoever with respect to this Sweepstakes and/or the awarding or use of the Prizes, (ii) make no warranty, guaranty or representation of any kind concerning the Prizes, (iii) disclaim any implied warranty of merchantability or fitness for any purpose, and (iv) are not liable for injury, accident, loss or damage of any kind resulting from the acceptance, conveyance or use of the Prizes or from participating in this Sweepstakes. The Release Parties are not responsible for typographical errors or any other errors in the offer or administration of this Sweepstakes, including but not limited to errors in the advertising, the Official Rules, the selection and announcement of winners, or the distribution of the Prizes. 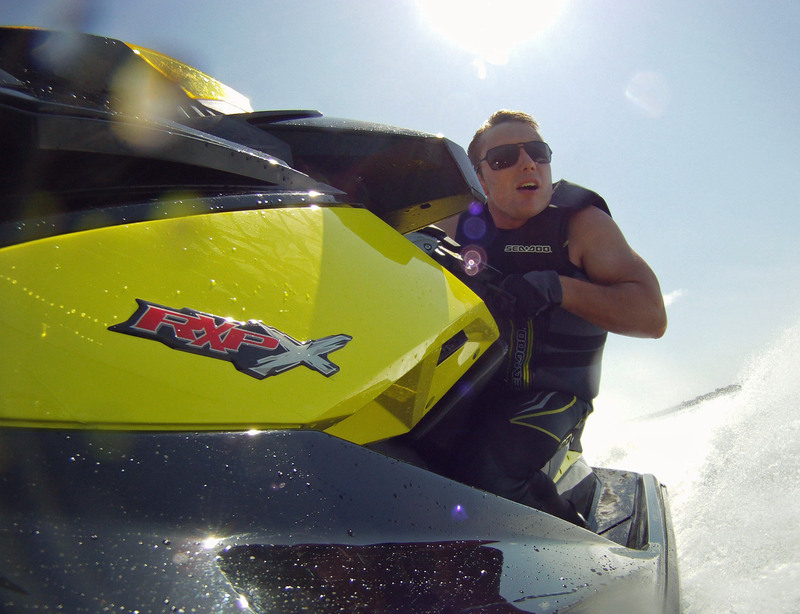 ULTIMATE SEA-DOO FAN UPDATE – Kevin Wassum goes to Havasu! Kevin Wassum has been logging more hours on his Sea-Doo RXT, just waiting for the day his 2012 Sea-Doo RXP-X is delivered, but in the mean time he wanted to give us an update on what his ‘SEA-DOO LIFE’ has been like leading up to his trip to this year’s IJSBA World Finals. Over the past few weeks I’ve been on several weekend watercraft trips. We took the Sea-Doos up to Crystal River to explore around the natural springs and interact with some Manatees. The water lived up to the river’s name and the fresh water springs pump clear 72 degree water into the river year-round. It’s a very cool place to ride and explore. We’ve also done a fair bit of island hopping, from Anclote Island all the way down to Egmont Key. It’s string ray season around Egmont Key and the island is beginning to be surrounded by thousands of swimming sting rays. Riding alongside large schools of sting rays is a very surreal experience. Lately it seems like our group rides are continuously growing in number of participants. 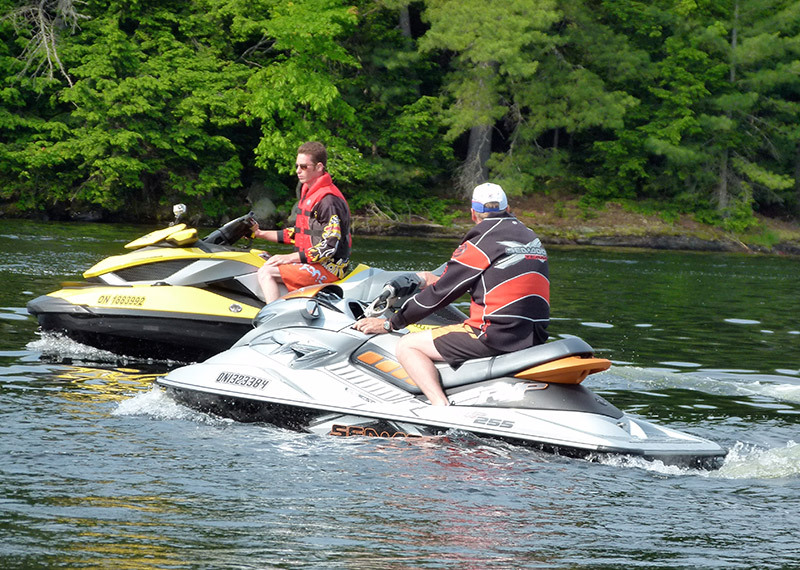 Our last outing consisted Sea-Doo personal watercraft and jet boats covering every year from 2004 to 2011. This last bit of summer has also provided us with quite an array of different weather patterns. We’ve had some really flat days that have been great for WOT runs and we’ve also had some really windy days that make riding in the surf a real challenge. Mostly we’ve just been out trying to enjoy what’s left of the warm-water riding season before the ocean temperatures drop. I’m really looking forward to the Havasu trip next week. My wife and I have never been out to Arizona so we’re pretty excited to see the sights and scenery during the Sea-Doo Ultimate Owner’s ride up the Colorado River. I also can’t wait to check out the races! This will be my first time attending a watercraft race event and I’m very curious to see how it plays out. I have a feeling that after I watch the World Finals, I’m probably going to get the urge to look into participating in some race events over here on the East Coast.